Partner with us in 2016! Did you know that right now in Houston, Texas, there are 60 women and 30 teen girls who participated in their very first Bible study EVER this year, and it’s all thanks to you?! We met Pamela in 2008 when she attended the pilot of Beauty by The Book. She fell in love with the idea of intimate small group studies for women, something she’d never been exposed to before. We were thrilled that she remembered us this year and invited Laurie to speak at The Lord Jesus Christ Holiness Church where eight area African-American churches were represented. Laurie was able to speak and minister to these ladies free of charge because of your generosity! At the event, we met Beatrice who felt the Lord prompting her to start a mother/daughter Bible study but had no idea where to begin. She turned to us and we have been able to help and encourage her every step of the way, including giving her a much-needed discount on workbooks. To date, God has used Beatrice to expose almost 100 ladies to studying God’s Word, and she’s not stopping any time soon! Can you see how the financial support we received over seven years ago is STILL producing a harvest for the kingdom of God? Imagine how far your gift will go! Today we are launching our 2015 Year-End Campaign. Our goals are to raise $50,000 and to enlist 100 new $25 or more monthly Priority Partners by December 31st. If we do, we will be able to expand our outreach to faith-based women’s shelters and children’s homes and help more women like Beatrice start their very first women’s Bible study groups! Young girls in the Missouri Baptist Children’s Homes. Dozens of pregnant teens through a ministry in Freeport, Texas. Women at the Central Wyoming Women’s Shelter who participate in a long-term rehabilitation program. 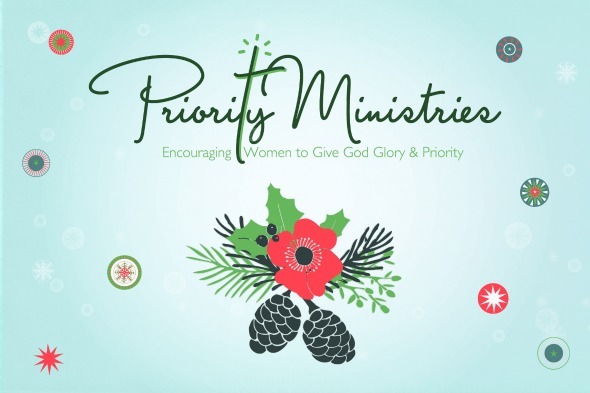 God is clearly using Priority Ministries to fill a void in women’s Bible studies. Would you be willing to make a generous year-end donation to help us meet our goals and bring women’s Bible studies to more women like Beatrice? that He is using your generosity to help us! As we celebrate Jesus – the greatest gift of all – this Christmas, we also celebrate the blessing of partnering with you in His service. Thank you in advance for your generous gift, your continued support and your constant prayers! P.S. Today, we launched our 2015 Year-End Campaign. Our goal is to enlist 100 new $25 or more monthly Priority Partners to continue bringing in-depth Bible studies to women. We can’t do it without your help. In addition to your year-end gift, will you become a monthly Priority Partner with your gift of $25 or more per month? To show your support, donate online today, or call us at 866-968-4564.